Wii owners in North America, you don't have to wait until Legend of Zelda: Skyward Sword is out on 20th November to play something new for your console: Kirby's Return to Dreamland is coming on 24th October. The four-player romp also be playable at the Penny Arcade Expo this week, so if you're in the Seattle area you can go hands-on with Kirby's latest on Wii and Kirby Mass Attack on DS too. We played the game back in June, so read our First Impressions: Kirby's Return to Dreamland for more on Kirby's comeback. It also has excellent box art, as you can see. This is going to be the greatest game ever made! Hope the release date goes for the UK too! Can't wait for this! Awesome! Great Box Art too! October 24th, that's my birthday sweet! The game is rated E10...Must be violent. @MiracleBlaze (2. ): We get Mass Attack on October 28th. Nintendo announced this game for a December launch in Europe. Which should about coincide with the last episode made available in the Wii's TV channel. Yep, I noticed that it's E10 too..
Looks like I'll be pretty busy come October. Too much Kirby goodness to keep track of the last year or so. Well I am in Seattle, might have to check out PAX! That boxart is awesome but I think they came up with a rubbish reason for King dedede and Meta knight helping Kirby. They're helping him get an alien back to its home planet? Seriously? That sounds too out of character for them. Why not have some really powerful enemy that threatens King dedede and Meta knight too like when King dedede helped Kirby defeat dark matter and 02 in kirby 64. The boxart is very cool, all bright and full of life and energy. 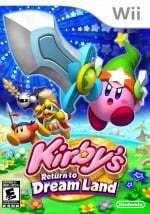 I have never played a Kirby game but I enjoy local Wii co-op platformers like DKCR and NSMBWii so might have to check this out. Awesome! Another chaotic 4 player Co-Op adventure for the Wii. I'm so glad that I own one. yah I have a new game to get for my birthday. This is awesome. "I realized that this and Kirby Mass Attack are both releasing in the same week. Now that's cool!" Nope. Mass Attack is coming out September 19th in the US. We've been waiting SIX FRIGGIN' YEARS for this Kirby game to come out! Lets hope it's worth the wait! The swords aren't big enough! Can't wait to force puke my co-op buddies. Wonder if Kirby can steal Meta Knights abilities? Lemme guess, is Kirby all happy in the Japanese box? Awesome! What about Rhythm Heaven? That is some awesome boxart. @Nintyfan We don't get to have Kirby week actually, while we're getting Kirby: mass attack on the 28th October, we're not getting Kirby's return to dreamland until December. @Ultra128: I was thinking the exact same thing, but my online search for their box art is turning up nothing at this time. I must say, though, this title is MUCH better than the European one. Now this is a Kirby game I can be excited about! Wasn't as thrilled with Epic Yarn. Not being able to inhale enemies just wasn't right. The money you would get for a Wii won't cover too much of the Xbox360 price. Especially the one with Kinect. I wouldn't even think about selling my Wii right now. we have a bunch of great games headed our way. Thanks to the dry season of games for the Wii... I have tons of money to buy all the super awsome new releases! This will most definetly not be revolutionary, but I'm sure it'll be a heck of a lot of fun. Sounds great! I don't know whether to buy this game when it's released or to wait until Christmas to get it. TOO TOUGH!!! Oh just rate it T already ESRB, lol. I've been waiting for this one! YES! If that isn't the case, I'd like to punch the ESRB committee in the face for giving a freaking Kirby game an E10 rating and roundhouse kick the director of this game for forsaking the awesomeness of Dark Matter (an entity that is in my opinion the most competent, awesome, and downright evil "villain" in the entire series). I guess even if we don't get Dark Matter in this game, it wouldn't matter since we still get a Kirby game in the first place. Nice box-art! Hopefully we Europeans get a concrete release-date soon too! 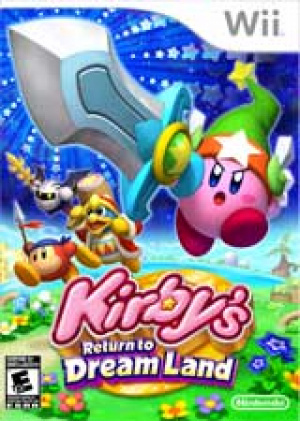 "Kirby's return to Dreamland" sounds nice. But "Kirby's adventure Wii" doesn't sound bad either! It gives you more the feeling that they are aiming for "Kirby's adventure NES" greatness! Either way, the game looks awesome and quicker then Kirby 64. I think this Kirby game will be better! I don't know if you guys already know the story? Well, it's pretty simple: A alien crashes with his space-ship in Dreamland, and Kirby and Co decide to search for the broken parts! That's all (or so it seems)! Kirby is not pleased with the ESRB for giving him that E10+ rating. This looks like it should be called "THE SWORD... also featuring Kirby"
Great, now another game i need to get this holiday season. Oh wallet, how will you ever forgive me? Ooh...birthday present. That boxart is quite nice too. Very colorful. I'm actually pretty surprised only a few people commented about this. I mean, remember the "scheme" business? I hope this one is better than Epic Yarn I was kinda disappointed in that one. I'm so, so glad we get another Kirby game on the Wii instead of something interesting like F-Zero. Is that the story? And the alien is called Olimar? Jokes aside, this seems to point that at least in NA the drought is over, as we are getting a good game per month (two in November) till the end of the year, starting in September with Kirby Mass Attack. Come now 57. MechaPhoenix, It's not like Epic Yarn was /really/ a Kirby game and plus we have waited for a real Kirby game since Kirby 64. We got an Amazing F-Zero for the Gamecube which lacked in Kirby platforming goodness (But had a wonderfully fun Air Ride instead). Although I still really want to see a new F-Zero Game I am still very glad we are getting this superlative Kirby. I still don't get the Epic Yarn hate. Fantastic game and still captured the cute personality of Kirby and had some amazing gameplay ideas. That being said, after playing this baby at E3, I was pretty impressed with it. Two great Kirby games for the holidays! Win-win! I agree Corbs. Epic Yarn was freaking awesome! I already have Mass Attack on pre order, so when I finish payin for that, this one's next. I loved epic yarn and i hope this will be better. Ah I might get it for my aunt's Wii! Agreed. The box art is screaming with fun, creativity and color. Anyways, Epic Yarn may of been ridiculously unique, original, creative and gorgeous from a visual standpoint, while delivering some truly heart warming fluffy whimsical tunes, coupled with killer satisfying controls and motion controls(horrible Chu Chu train aside:p) ect ect. That aside, I have a feeling 'Kirby's Return to Dreamland' will offer a bit more fast paced fun and of course challenge. After all you can die...Then again, this IS Kirby and challenge isn't exactly the name of the game. If only we had a hard mode from the start. And funny enough, I'm listening to Kirby's Epic Yarn - Snow Land while typing this haha. Now if there were special challenges like "complete level x with Samurai Kirby only" or something akin to the ones in Wario Land: Shake It! this game would be even better imo. Fantastic artwork! I was a bit surprised by the E10+ rating, especially since this is a Kirby game. Then again, you can use a giant sword to slash stuff. Kirby's Epic Yarn was a fine game, but Kirby's Return to Dream Land looks even better. I'd definitly love Objectives simular to Wario Land Shake it! It would bump up the challenge incredibly(at least it did BIG TIME in WLSI!) and would offer a more meatier, fun, addictive and rewarding experience. Another "Returns" game which has concepts that ive been waiting for all these years but without an epic name. This is gonna really be a popular holiday game most likely beating out Rayman Origins but they even came up with a catchy title for that game. but for a good laugh everyone read the first comment hahahaha best game ever. Riiiiiiight. I'm buying it to thank NoA for not sticking Wii on the end of the title. I am ALL OVER this when it drops in NA. This game's looking pretty good. Can't wait for a PAL version to come out. @71: Yeah, that honor goes to Epic Yarn. I've been waiting for this game. As long as Nintendo doesn't give the game bad controls or move it to Wii-U at the last minute, I'll be happy. "And the alien is called Olimar?" Lol. I have no idea what he/she is called! This looks to be the best Kirby ever, in my opinion. My one complaint about the game is the fact that it is rated E 10+. This looks like Smash Bros., but in a real (i.e. decent) platforming game.